September 04, 2018 at 1:06 pm. 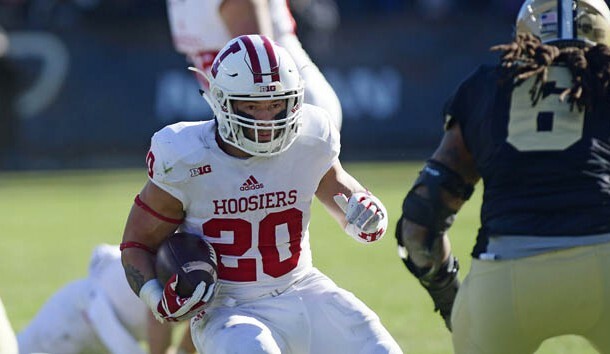 Indiana running back Cole Gest is expected to miss the remainder of the season after sustaining a torn ACL in the season-opening 38-28 victory over Florida International. Gest stepped up in place of 2017 leading rusher Morgan Ellison, who was suspended indefinitely by the football program for violating unspecified team rules. “Hate it for him,” head coach Tom Allen said of Gest’s injury. “I know how hard he’s worked and played extremely well when he was in there. (He’s a) great, great person, works unbelievably hard and, obviously, has a setback now he has to handle. We’ll be with him side by side through this whole process and he’ll come back stronger than ever and he’ll bey with us again in the future. Gest rushed five times for 17 yards before sustaining his injury. He totaled 428 yards on the ground last season. Stevie Scott rushed for 70 yards on a team-high 20 carries against Florida International. Ellison is expected to remain unavailable for the Hoosiers’ next game versus Virginia. He rushed for 704 yards and six touchdowns last season, highlighted by 186- and 149-yard performances against Georgia Southern and Rutgers, respectively. Ellison also caught nine passes for 60 yards.